Is Quora an oracle, or just a Q&A for clever people? 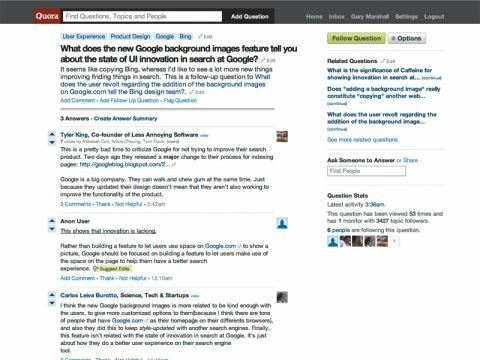 The Quora website hopes to be the place you go for definitive answers on everything from tech startups to which TV to buy, and it's already raised sacks of cash from excited venture capitalists. So is Quora like Wolfram Alpha – a new way of finding and analysing information – or is it just Yahoo Answers with a better education? The site combines Q&As with social networking, so you can search for people and follow them to see what topics they're interested in. For example you can follow Twitter's Evan Williams, who is currently tracking topics including Twitter, Facebook, startups and bacon. When somebody answers a question, you can 'vote up' their answer, just like you would on Digg, and you can endorse users in much the same way as you can hit 'Like' on Facebook or say something nice about a colleague on LinkedIn. For now membership is heavily tilted towards the Silicon Valley tech community, but that may change when it exits beta. A lot of Q&A sites choose to close topics once the original poster has approved an answer, and there are often lots of duplicate questions and sheer idiocy to wade through. Quora's different. Questions evolve, with users editing them and combining duplicates into single entries. You can follow topics, questions or users that interest you, and anonymous comments are banned. Quora's problem is that it has too many rivals. For facts there's Google, Wolfram Alpha or Wikipedia; for products there's Hunch, Epinions, and DooYoo. If you want to see people quizzed, you can go to Formspring.me. For opinions, there's Twitter, LinkedIn, Facebook, Digg, Ask Metafilter, Answers.com, Stack Overflow, Mahalo.com, the Google-owned Aardvark and more. Quora is trying to enter not just a very crowded market, but one that web behemoth Facebook is also about to enter with Facebook Questions – so its chances of being the Q&A site to rule them all are looking slim.